Ducted & Split System Air Conditioners require regular maintenance to keep them in working order through the hottest summer and coolest winter. A fully cleaned and efficient air conditioner will ensure your air conditioner is working to its full capacity giving years of comfort and energy savings. As below, having clean filters will help to keep the whole family breathing easy. 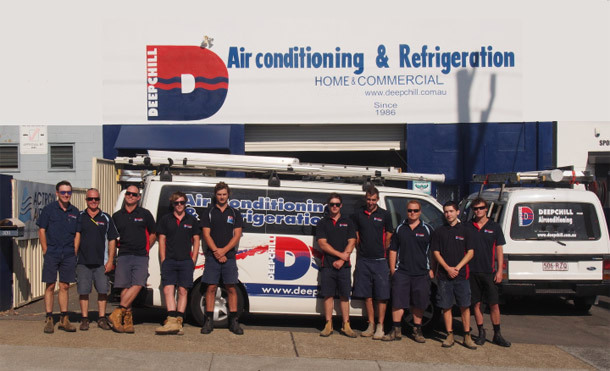 Deepchill Air Conditioning & Refrigeration has been servicing and maintaining commercial refrigeration and both domestic & commercial air conditioning systems on the Gold Coast since 1986. We employ seven qualified & licensed refrigeration & air conditioning technicians and are proud to have several apprentices in training looking to the future of our industry and supporting our youth. We also have a maintenance team who can fully service all refrigeration and air conditioning systems – we offer a Preventative Maintenance programme to regularly service your equipment to keep it in full working our when you need it the most. Our service department is managed by our full time service manager who will arrange a suitable time for our technicians to attend.